Justin Simon bringing the ball up. Photo by Jason Schott. 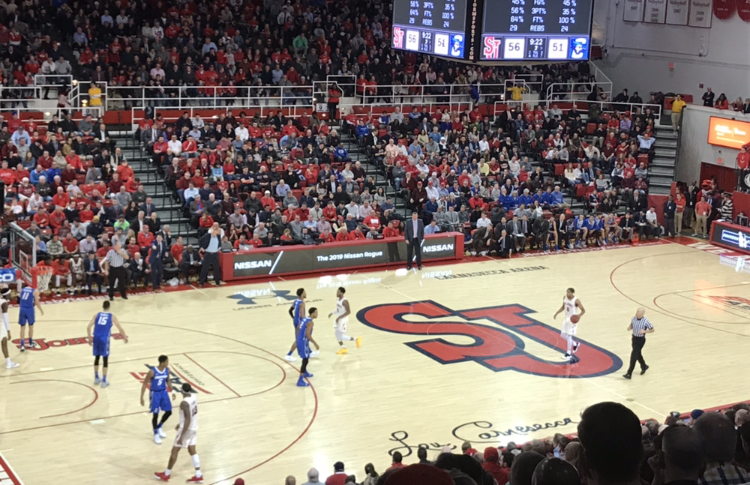 The St. John's Red Storm came back from an early nine-point deficit to cruise to an 81-66 win on Wednesday night at Carnesecca Arena. This was a much needed win for St. John's, as they improved to 3-3 in Big East play (15-3 overall) after losses to Villanova and DePaul last week. St. John's point guard Shamorie Ponds, who missed Saturday's loss against DePaul with lower back pain, was a game-time decision for this one and he passed the test to score 22 points on 8-17 from the field, including 2-4 on three-pointers, with 6 rebounds, 3 assists, and 2 steals. St. John's trailed 28-19 early before Ponds reeled off eight straight points ( a pair of three-pointers and a jumper) to pull them within 31-27 at the 5:08 mark of the first half. After a Creighton turnover, Justin Simon got a layup and was fouled. When he missed the free throw, Marvin Clark II swooped in for the put-back to tie the game at 31. The Lou (coined by Josh Adams of College Hoops Digest) was rocking, and the momentum continued as LJ Figueroa got a layup and Simon drained a three-pointer, followed by a steal, and he made a free throw to make it 37-31 St. John's with 3:16 left in the first, capping off a 13-0 run and an extended 18-3 stretch. St. John's took a 39-34 lead into halftime. Creighton came out strong in the second half, pulling within one, 42-41, on a three from Davion Mintz four minutes in. Their surge was short-lived, and from then on, it was all St. John's. St. John's went on an 11-2 run capped by a Simon three that made it 52-43 at the 12:53 mark, and then after Creighton pulled within five, they went on an 8-2 run capped by a Figueroa layup to make it 64-53 with 6:56 left. The Red Storm led by as many as 17, at 81-64, on a Mustapha Heron dunk with 1:15 left. In addition to Ponds' 22 points, Heron finished with 18 points on 7-10 shooting, including a three-pointer, with 3 rebounds, in 27 minutes (he was limited to 12 minutes in the first half due to two fouls in the first three minutes). Simon also had 16 points (6-17 FG, 2-4 threes) with 6 rebounds, 4 steals, and 3 assists. Creighton was led by Marcus Zegarowski with 17 points on 6-11 from the field, including 5-8 from behind the arc, with 4 assists and 3 rebounds.